Contract counts for the Conservation Stewardship Program and the Environmental Quality Incentives Program represent the year 2015 using "date certified" or "sign-up year" for various nutrient management practices. All public water systems locations represented on the map are approximate, and meant to visualize the general area of a contamination site or public water detection. Locations were mapped using the best available data preserved in U.S. EPA’s Safe Drinking Water Information System, or SDWIS. Two-year averages for nitrate and trihalomethanes, or TTHM, reflect all samples collected between 2014 and 2015 for each water system included in the SDWIS program. 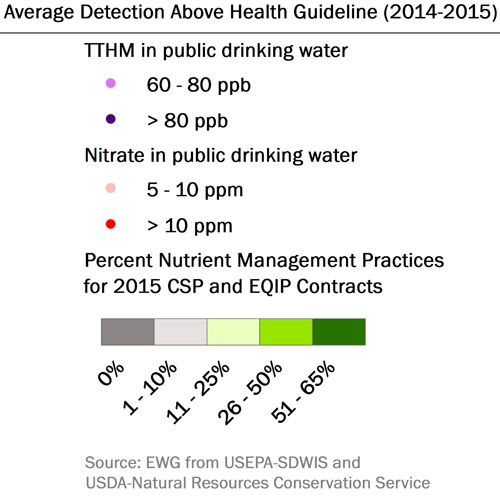 EWG’s health guideline for nitrate is 5 ppm or half of the legal limit (10 ppm), and TTHM points represent 60 ppb or 75 percent of the legal limit (80 ppb).